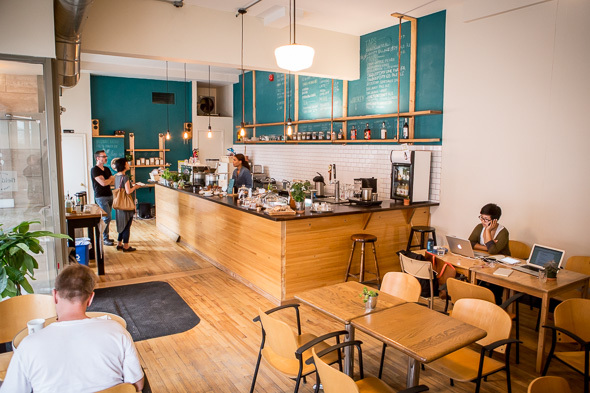 Field Trip Cafe (not to be confused with the music and arts fest ) is a gem of a place hidden a bit up Westmoreland off Bloor in Bloorcourt . 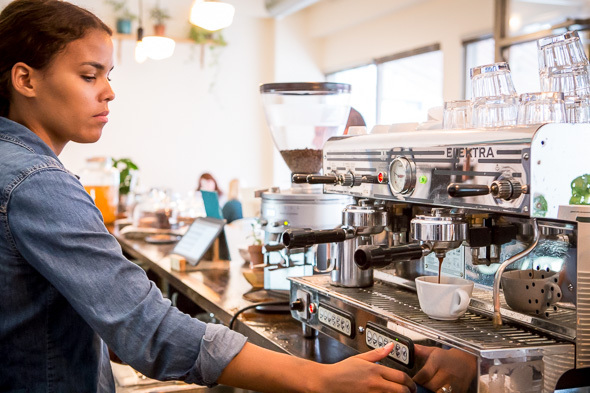 Co-owners Angela Brock and Ian Cameron have taken over the space that was formerly El Cafecito and converted it into the cafe and bar they've both always wanted. Filled with natural light, this bright and airy spot has a homey vibe: succulents and other plants can be found all around, along with hanging Edison bulbs, a white brick backsplash, copper piping and wood shelving that Brock and Cameron installed themselves. WiFi access makes this a welcoming space for freelancers, and a nice-sized licensed, west-facing patio is a nice bonus feature (and a sweet reward for a hard day's work). 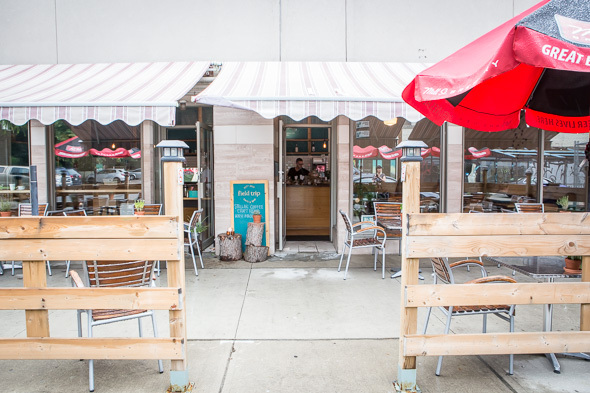 Like many of the products offered here, the name of this cafe and bar came about organically; the two liked that it evoked images of a farm and fresh ingredients (in keeping with this, Field Trip is a Fresh City Farms pick-up point), and they embarked on field trips themselves when going around to research other cafes. 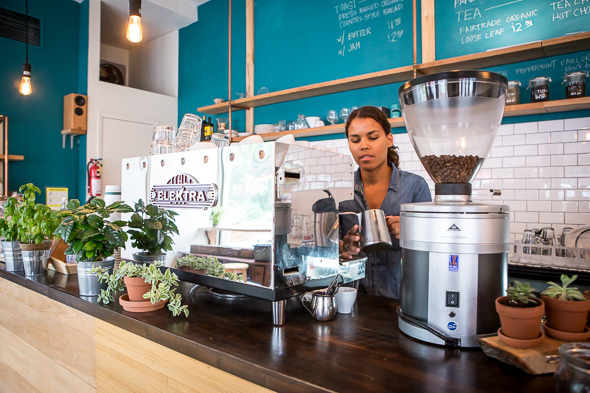 Both Brock and Cameron previously worked at Merchants of Green , so they know their coffee. 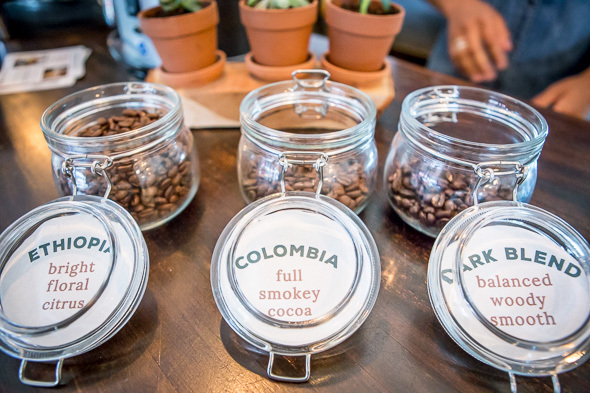 A choice of single origin beans from Velvet Sunrise are brewed to order in a precise manner using a French press-like steep-and-filter method ($2.38/12oz. cup). 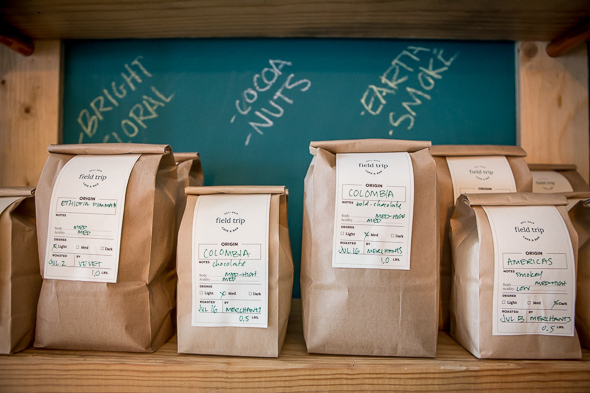 "We're coffee nerds but we just want to make things simple and yummy," says Brock. Propeller espresso beans are used to pull shots (espresso, $2.25 - single shot $1.75; Americano/macchiato, $2.50; cappuccino/cortado, $3.25; latte, $3.50) on an Elektra machine that was fixed up by espresso machine repair expert and coffee bar owner Tony Cavaliere, of Oakwood Espresso . 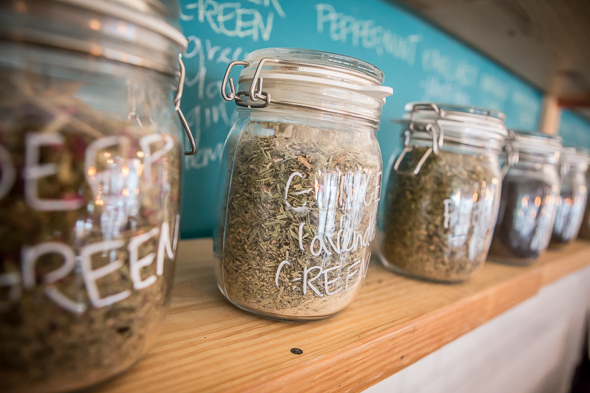 A nice selection of fairtrade organic, loose leaf teas ($2.38 each) come from North York's Whole World and house-made organic ginger green tea lemonade ($3.75) as well as Owl & Goose cold-pressed juices are available as coffee alternatives. Organic, freshly baked country-style bread from Prairie Boy are used to make toast spread with butter ($1.75) or Stasis Preserves jam ($2.50), and are for sale by the loaf ($6.50). 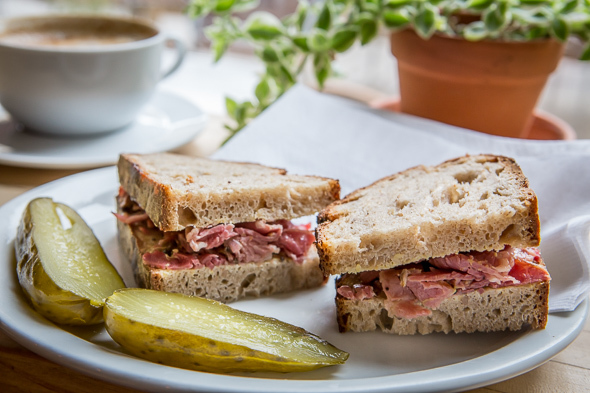 They're also used for house-made sandwiches ($5.50-$7.35) that are prepared fresh daily - the day we visit, a smoked meat on rye sammy offers a taste of Montreal with Moishes pickles. There is always a veggie or vegan option (when we're there it's a house-made hummus and avocado sandwich), and a late night menu is in the works. 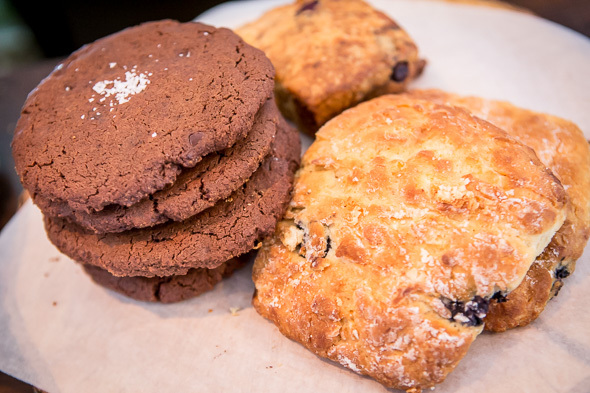 Baked goods ($2-$3.75), which also include vegan and gluten-free options, come from Sliced . As for alcohol, the focus is on beer and whiskey. 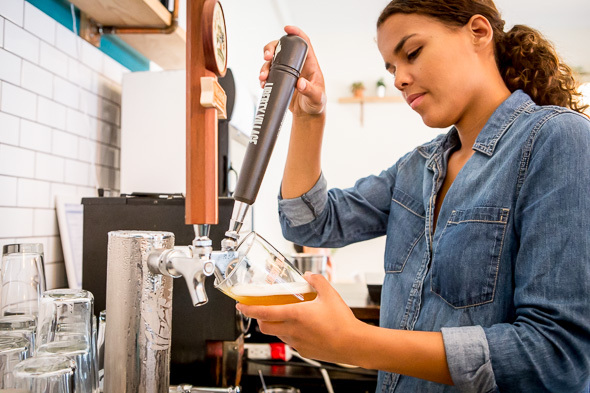 Beer-wise, there are currently two options on draught - Beau's Lug Tread and Liberty Village Brewing Co.'s 504 Pale Ale ($7 each) - with plans to add more taps in the near future. 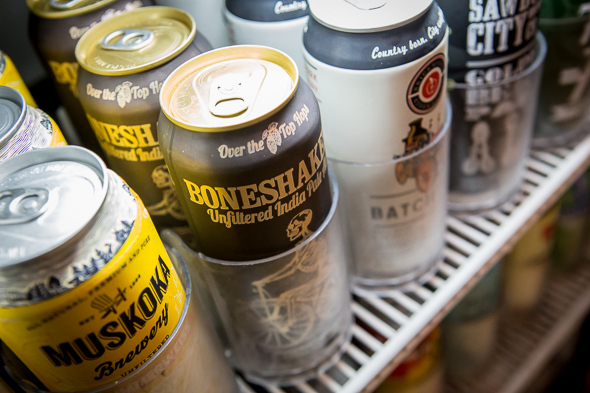 Tall cans (also $7 each) include Brickworks Cider, Nickle Brook Gluten Free, Sawdust City, Side Launch, Junction Craft Ale and Hops and Robbers. On the whiskey front, bourbon, Canadian whisky and Scotch are well represented with Bulleit, Woodford Reserve, Spicebox and Glenrothes (single shot, $5.25-$7.25; double $9.50-$13.75). Favouring local craft roasters, breweries and bakers, Field Trip is a refreshing find that's worth an amble slightly off the beaten path.